Why I’m Voting Muriel Bowser for Mayor | "Not About Quality"
Ward 4 council member Muriel Bowser (murielformayor.com). The DC primary elections are April 1st, and early voting has already started. The Democratic primary is where most DC elections are decided, and it looks like we’ll have a close race for mayor. Incumbent Mayor Vince Gray and Council member Muriel Bowser lead the pack, with Council members Jack Evans, Tommy Wells, and Vincent Orange also mounting credible campaigns. I’ll be voting for Muriel Bowser. I am comfortable with where most of the candidates stand on the issues, so for me this election comes down to who can best lead the city. DC government has come a long way in recent years, as has the DC economy. I look for a mayor who can continue that positive momentum, while broadening our newfound prosperity to benefit all residents. While the city may not be divided by partisanship (DC voters are basically all Democrats), DC politics is sharply divided along geographic and racial lines. 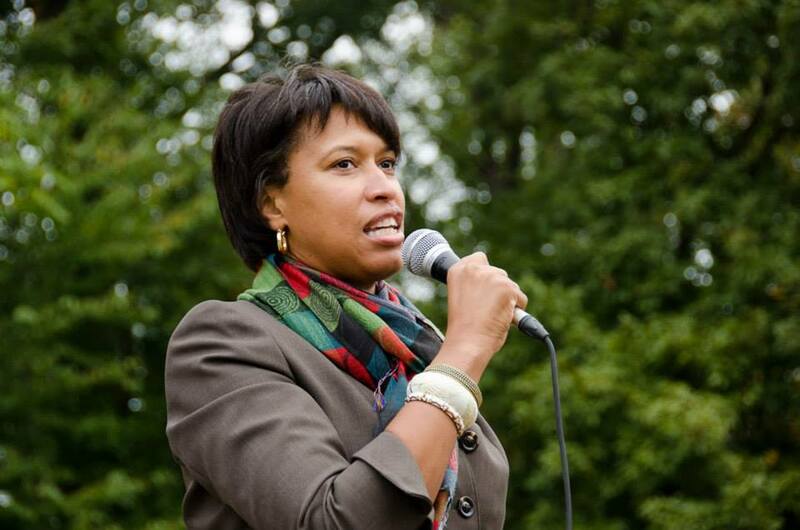 To me, Muriel Bowser is the only candidate who can speak to the entire city. That comes through in the polls. Bowser has gained substantial support among white voters, and runs second behind Mayor Gray among black voters, according to a Washington Post poll. I have not seen polling that breaks down support by Ward, but I imagine it would show Bowser (and possibly Gray as well) as the only two candidates that get meaningful support in all eight wards. I almost voted for Mayor Gray. I think he’s done a fine job as mayor. Gray has continued many of the reforms that were started by previous mayors Anthony Williams and Adrian Fenty, and often with less rancor than Fenty. But the corruption and shadow campaign charges are too much for me to stomach, and I think the city can do better. Tommy Wells was also tempting. Wells has compelling progressive views, and I tend to like his work on the Council. But Wells has the same problem that the rest of DC’s white progressive community seems to have: they only appeal to other white progressives. According to that Washington Post poll, Wells has the support of two percent of black voters. Two percent. I don’t want a mayor who is thoroughly rejected by half the city. The lack of broader appeal should be deeply troubling to DC’s white progressive community. As a white progressive myself, I have a lot in common with this group. It’s probably a bit unfair to call them “white progressives” — certainly there are nonwhite progressives in DC — but this community is definitely more isolated more than it should be. The fact that Tommy Wells, who strikes me as a solid candidate, is polling at two percent among black voters should cause some serious soul searching among his core supporters. I’m sure they think his views should have broader appeal, but the white progressive community needs to do some serious outreach and change to make their community less white. To me, Muriel Bowser is the one candidate who can keep DC moving forward and clean some of the corruption out of government, in a way that can appeal to all DC voters. Whether you agree or not, remember to vote on (or before) April 1! This entry was posted in Uncategorized and tagged DC, Jack Evans, Muriel Bowser, Tommy Wells, Vince Gray, Vincent Orange on March 29, 2014 by Harry Stein. Bowser: Let’s step back, because I think it’s interesting that my opponents will talk about my experience, but they won’t talk about anyone else’s. What’s Jack Evans’ experience? [Pause] Do you know? DCist: He has a large legislative record from being on the Council for decades. Bowser: But what does that have to do with being mayor? Nothing. What’s Tommy Wells’ experience? Ever write about that? It’s a question. DCist: When we interviewed him, yeah. We talked about the legislation that he’s introduced. Bowser: What does that have to do with being mayor? DCist: Introducing legislation, what does that have to do with being mayor? It shows the vision of a candidate that they have, what they want to focus on, and what they think is a priority for the city.